As someone who lived in Nevada, hearing that is like nails scratching down a blackboard. Knee tingling awful. Back to Kentucky. The name is pronounced “Lool-ville.” Only, it’s not that easy. You’ve got to do that “ool” in the back of your throat, all guttural. Aside from having a name that bothers my throat, setting up shop in this quaint semi-Southern town was the perfect ending to our road trip across America. The drive from Chicago to Kentucky (I don’t even like writing the name of the city because even thinking about it gives my throat sympathy vibrations), is entirely uneventful. Indiana is … Indiana. 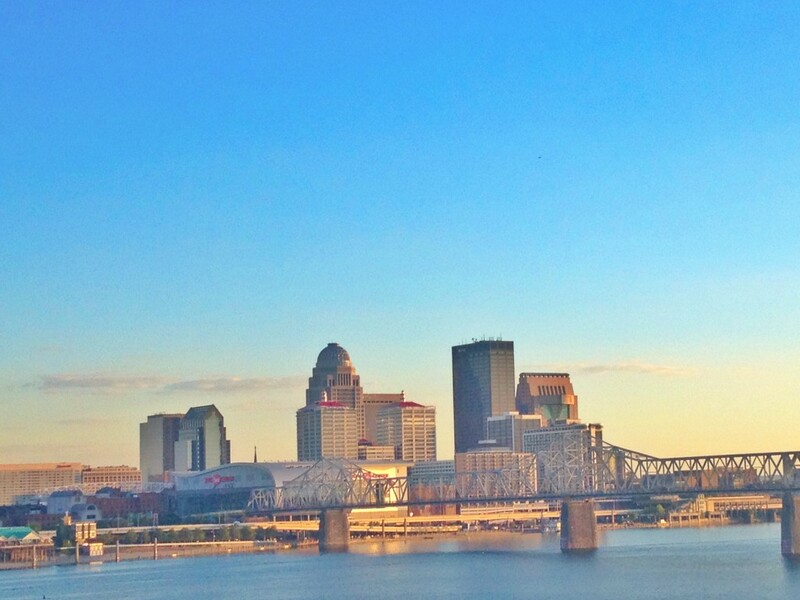 We shoot across the state fairly quickly, crossing the Ohio River into Kentucky just as the sun begin to sink, turning the city into a pretty picture of pinks and blues. 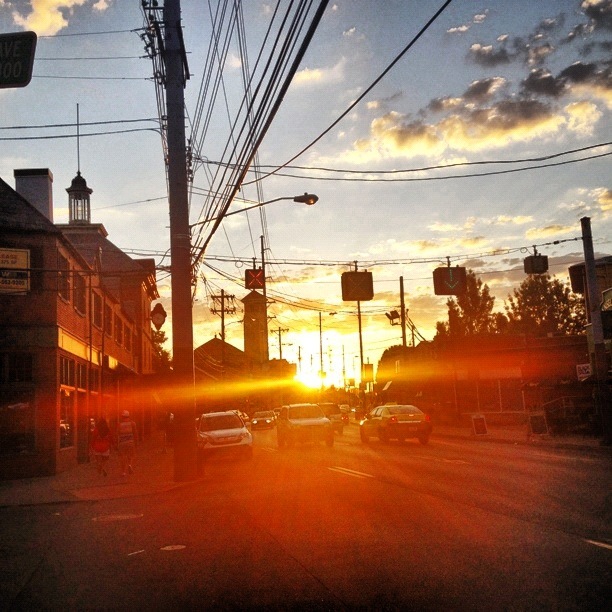 With a few hours until my friend we are staying with, Karen, gets out of work, Erica and I have some BBQ and enjoy the golden hour over the charming restaurant-lined main street. 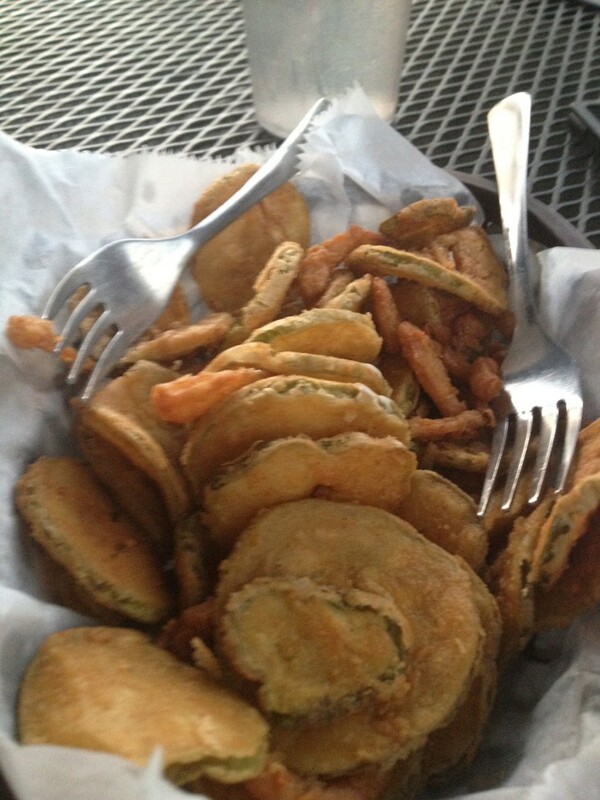 Those, my friends, are some tasty fried pickles. 1. Don our best dresses and fascinators and head to the horse races. 2. Tour the disco ball factory (the town is home to the largest maker in the world). 3. Drink bourbon. Which for some reason, my whisky-loving mind cannot do. We, as a duo, accomplished only one of those things. Half-way. 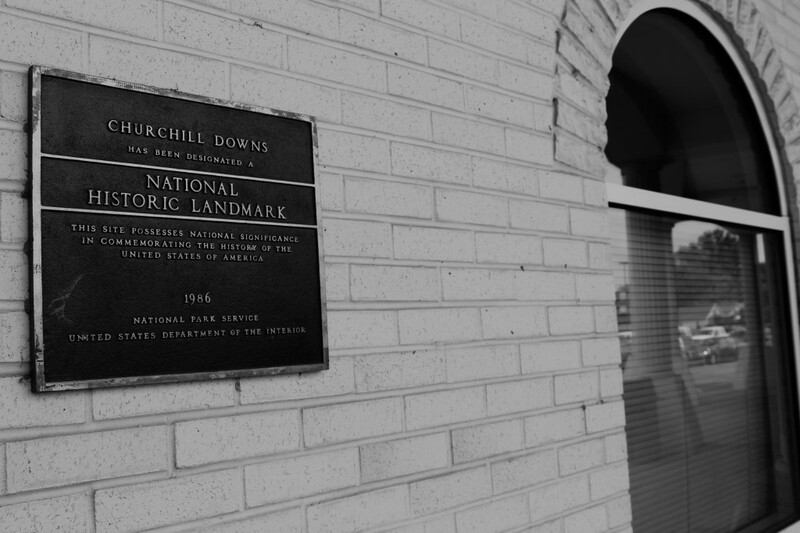 On our first full day in Louisville, we wake up and head to Churchill Downs. It’s a hot day. The sun is out as we park our car in someone’s parking lot/yard and head into the grand building, and later, the grand stand. The guy running the lot offers us tickets in the stands for a whopping $5. General admission is $3, so we decide being in the shade and in the stands is worth the $2. Then, we cross the street and head into the complex. It’s not nearly what I imagine. In my mind, I expect to see women dressed to the nines, extravagant hats perched on their well-coiffed heads, sipping Mint Juleps with ice that clinks gently as it settles to the bottom of the glass. Yeah. That doesn’t exist. Except for maybe during the Derby. Today, the people are normal. Shorts. T-shirts. The only hats people have on are baseball hats (and the fedora I threw on my head in an effort to look cooler than I am). It’s not crowded, either. 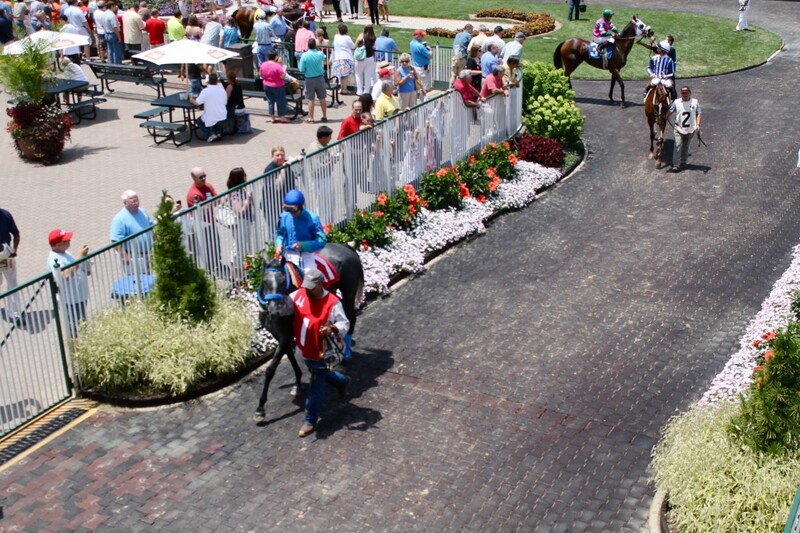 Even though the parking lot looks packed, walking into the track results in a crowd where the horses hang out before the race, and by the betting area. The stands … they’re pretty much empty. Erica and I have no clue how to place bets. I’ve only bet on horses once before when I was living in Las Vegas. My friend, an odds-maker, walked me through it. Today, he does the same, sending me text messages on how to bet and what to bet. 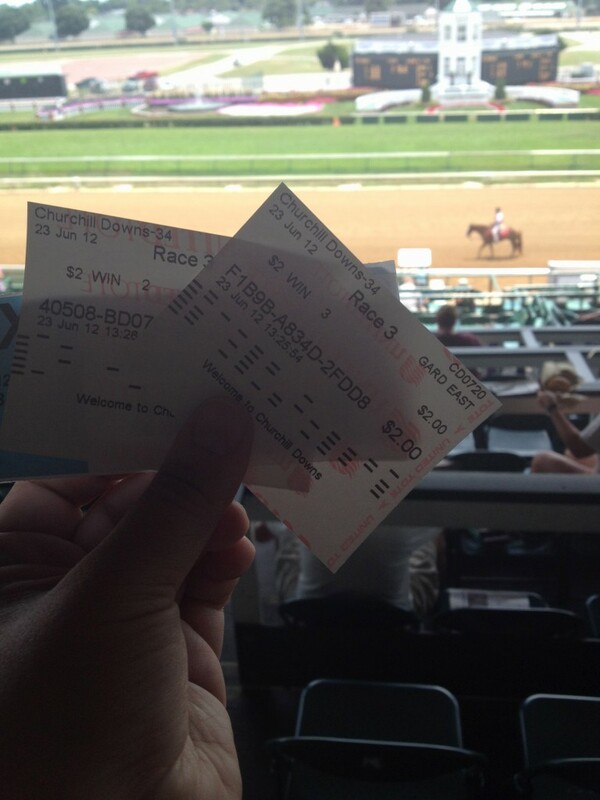 Then, after betting $2 on the winner of the race, we head up to our seats to watch. Giddy, we clutch the little pieces of paper in our hands as the horses are brought out and strut around the starting line. Then, they’re off. Galloping. Thunking their hooves onto the peachy dirt. 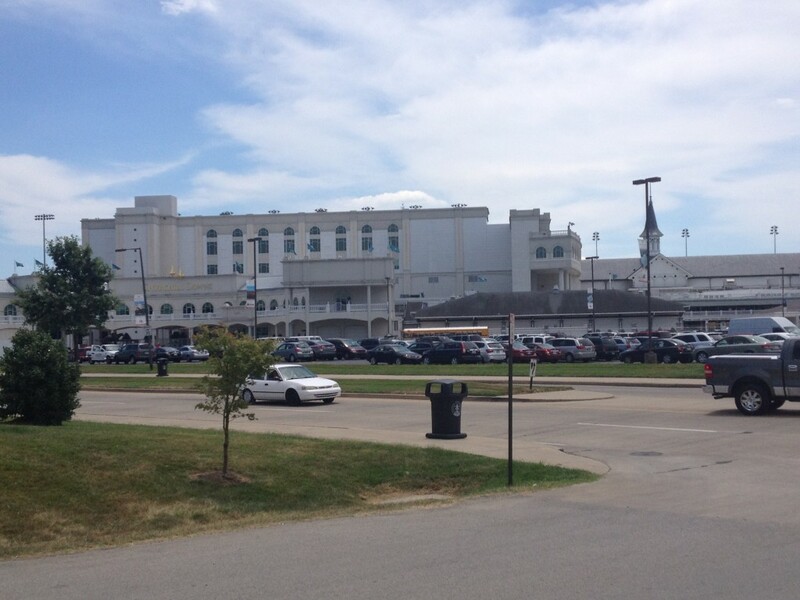 As we leave Churchill Downs, we’re still happy. Still excited. And, our day is young. There’s a murder mystery party to attend. Editor’s Note: This post is a part of the #winosontheroad series. Over Yonderlust and d travels ’round went road tripping and exploring America from Colorado to Maryland in June 2012. 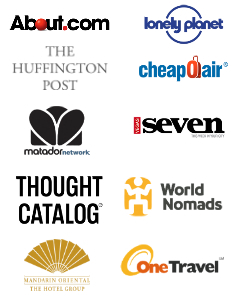 Be sure to check out all of the posts of life on the open road. I LOVE the miniature horse photo! So vivid and so Adorible! Just look at the ponies! I’ve always wanted to watch a horse race – but have never been to a city which the sport is popular! Thanks! 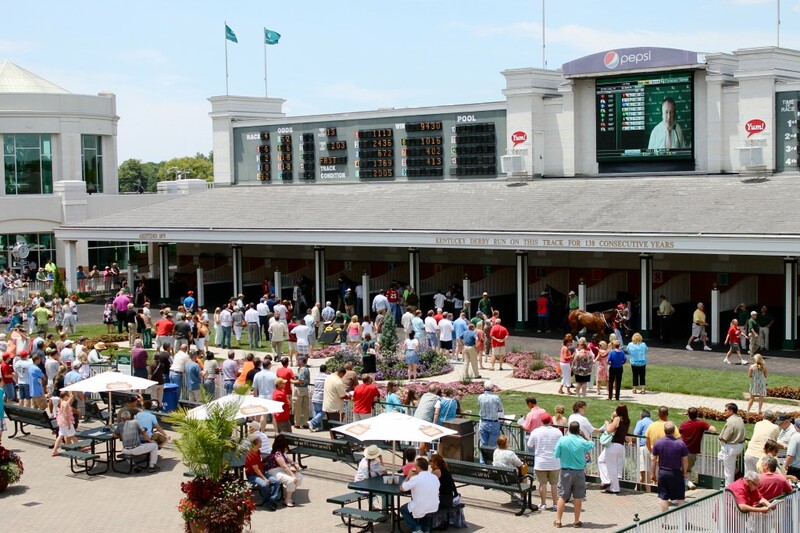 I’ve never really thought about horse races … even growing up in Maryland with The Preakness. But, going there and doing it was one of those things I am glad I did! I think I just watch too many movies with horse races in them! I always want to go. And bet on the horse in #4. I have no real care if it wins or loses. I just want to be screaming in the stand shaking my ticket. Do people do that there? For $2 a bet, it is OK to always bet on #4!! When the race gets intense, they definitely scream! I know when our horse came back and won, we screamed! I get the impression Louisville is a well kept secret. I’m hoping to go there this fall to check it out. And win some big bucks on the horses! It is! Like Omaha! As for the big bucks … good luck! Oh man I would have been kicked out the first moment I opened my mouth, I was pronouncing it the wrong way my whole life. Your posts are making me want to get in my car and drive three hours north of Louisville, stat. I did the Bourbon Trail last month, but we stayed about 45 minutes out of the city in Bardstown so I’ve never actually been to Louisville. .5 out of 3 isn’t bad? And while we didn’t TECHNICALLY do the Bourbon tour, you did get to take a “mini” tour by a not so hard on the eyes boy. YES!!! That was good whisky. I mean bourbon. Does this mean you skipped Ohio?!! I’m so hurt! We did skip Ohio. But, don’t be hurt! I lived there for 1-1/2 years back in my college days! One day, I will make it there for the Derby!!! I think it would be a blast! 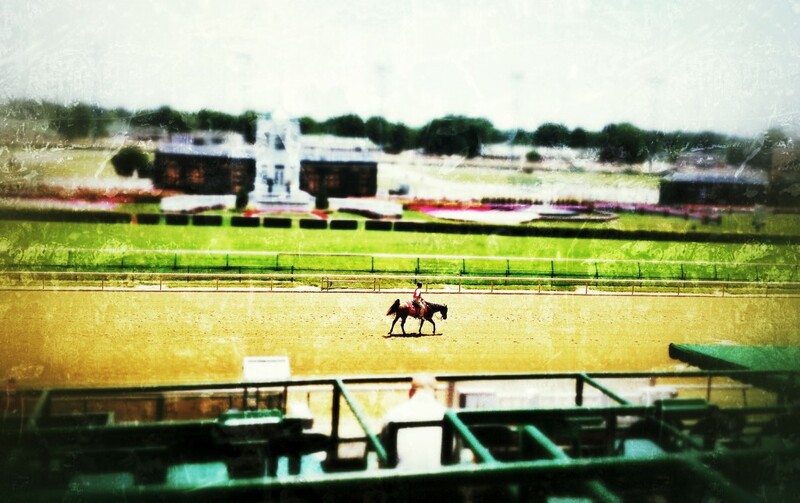 Churchill Downs is an awesome place to visit. 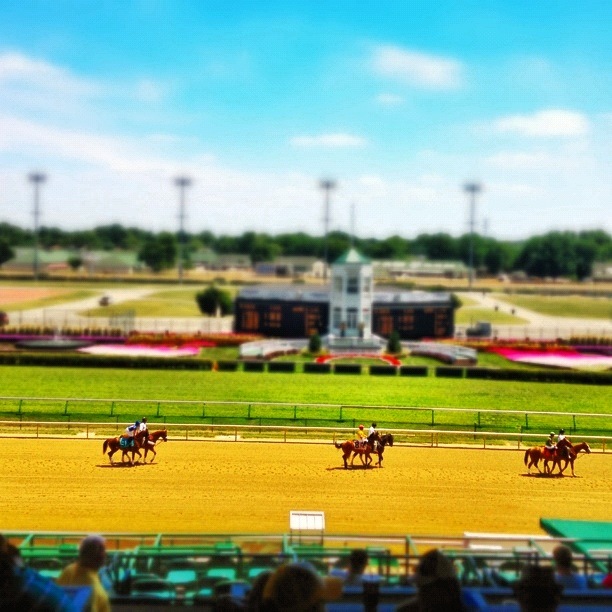 The Kentucky Derby is soooo on my bucket list (though I have heard that tickets are SUPER expensive if you want to be in the stands where you can see the race). The Kentucky Horse park is also a nice add on to a visit to Churchill downs. 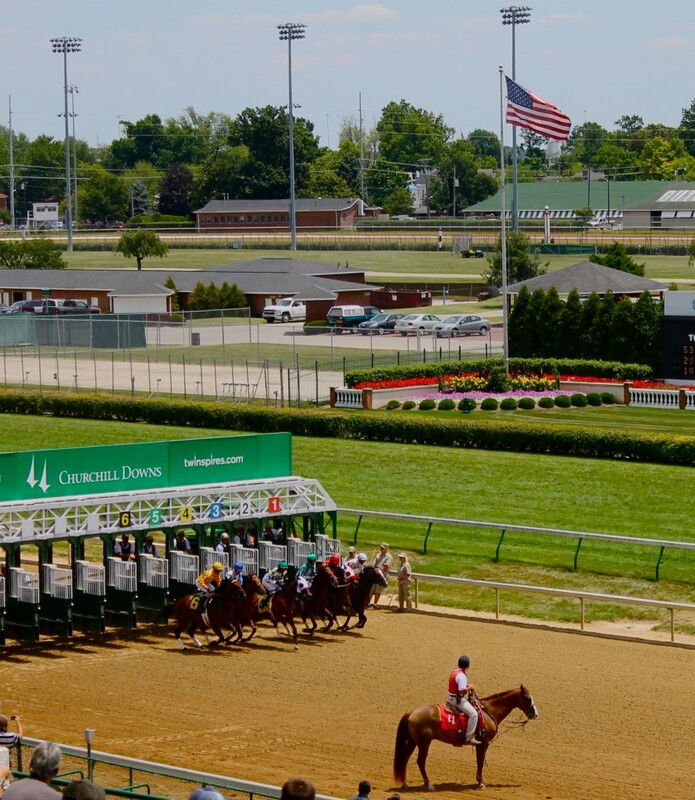 We learned a lot here about some of the great horses that have run on the track at Churchill Downs. I would love to go to the Derby! Great piece! I’m from Kentucky and have always pronounced Louisville the way you described it. People from around the state usually pronounce it like that, whereas native Louisvillians can be found to stray a bit. In fact, there are various ways to say it: Louie ville – I hate the way it sounds “Lou u vull” and the way you described it in your post. 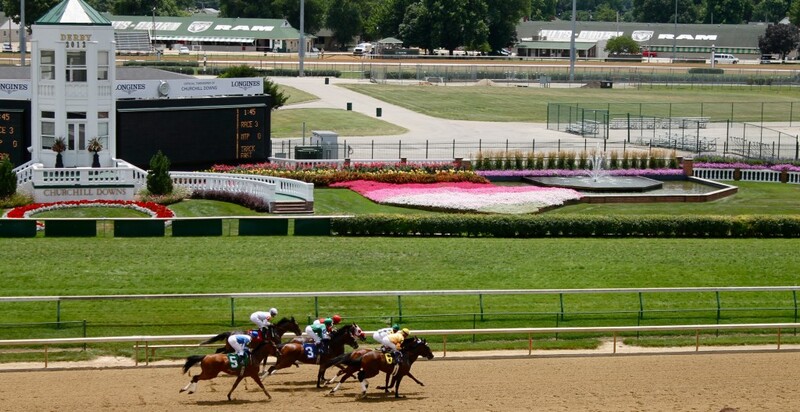 As far as the track is concerned, Churchill Downs is fun but it really is dead until the week of the derby (The Oaks and the Derby are the big events that first weekend in May). However, if you are looking for the atmosphere of the derby with hats and such I’d recommend going to Keeneland in Lexington. 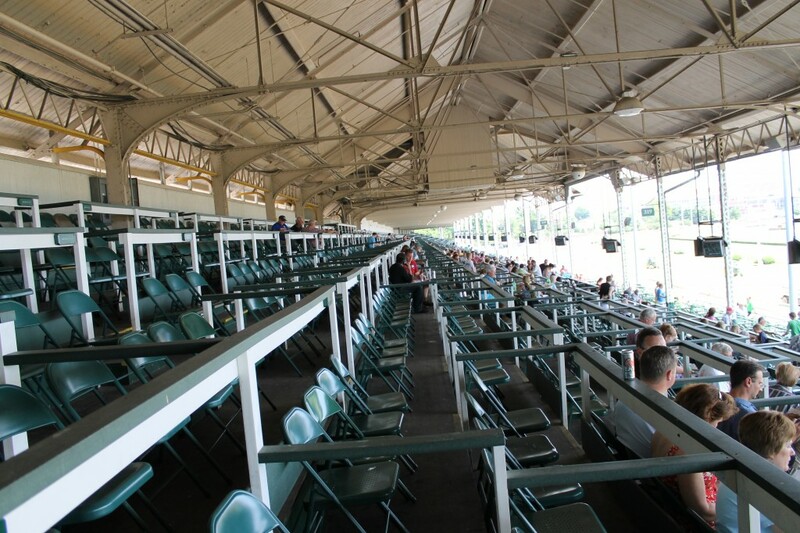 That is truly a hidden treasure for horse and horse race fans. Oooo!! Next time I am that direction, I will be sure to check it out! !